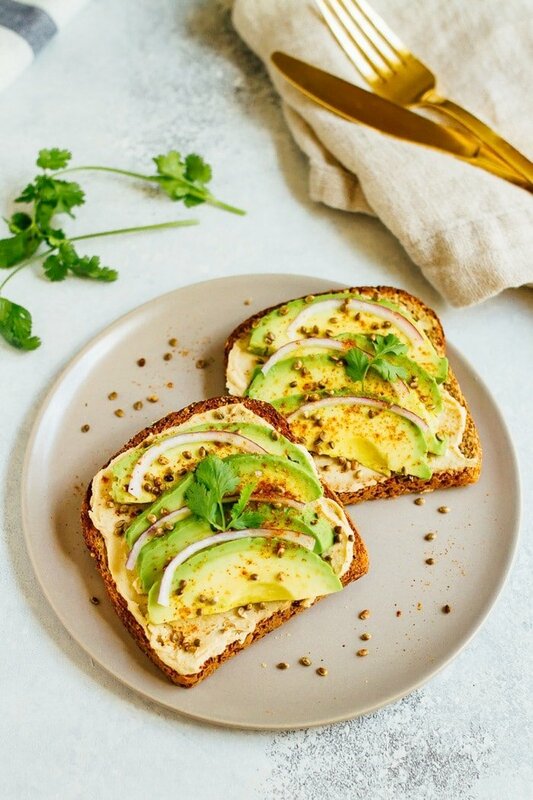 Hummus avocado toast makes for a quick and easy breakfast or snack idea. 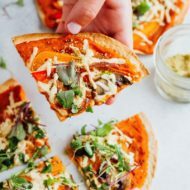 Load up each slice with red onion, cilantro and toasted hemp seeds for extra flavor and crunch. I don’t know about you, but I’m certainly not over the avocado toast trend yet. It’s just too good to give up and I love playing around with different topping ideas. Today’s hummus avocado toast is such a good combo. It’s loaded with garlicky hummus, creamy avocado, a little red onion, cayenne pepper and sriracha toasted hemp seeds for a spicy crunch. 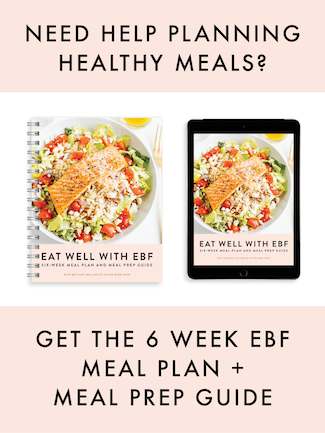 I have a ton of hemp seed recipes here on EBF, but until now all of them have called for hulled hemp seeds or hemp hearts. So today we’re shaking things up with toasted hemp seeds, a new product from one of my brand partner’s Manitoba Harvest. 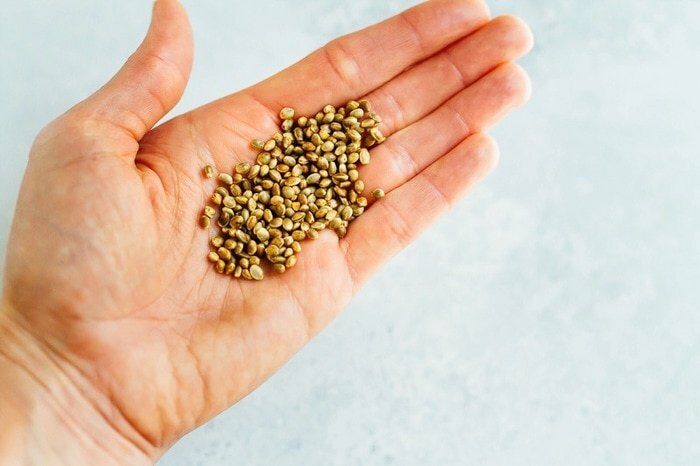 Manitoba Harvest is well-known for their Hemp Hearts which are the hulled seed, whereas toasted hemp seeds are the seed with it’s shell still intact. 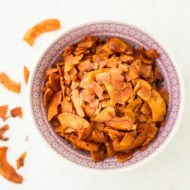 They’re similar to sunflower seeds, which you can buy in the shell or shelled. Hemp seeds are the same, just smaller seeds. And it’s funny because I actually think the flavor of the toasted hemp seeds is very similar to sunflower seeds with the shell. Here’s an up-close shot of the toasted hemp seeds so you can see just how itty bitty they are. 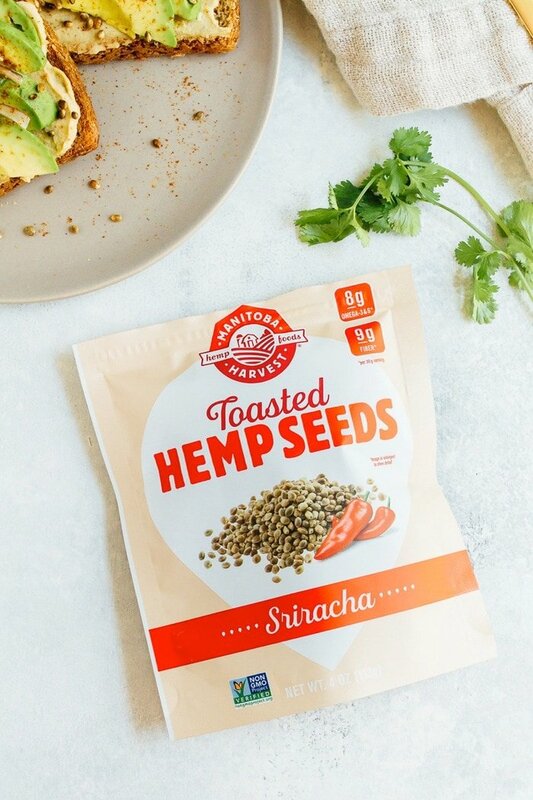 Manitoba Harvest currently has two flavors of the toasted hemp seeds — sea salt and sriracha. Both are great, but I picked the sriracha for this recipe because I think the hummus avocado toast tastes delicious with a little kick of spice. You all know I love to heat things up with my recipes! 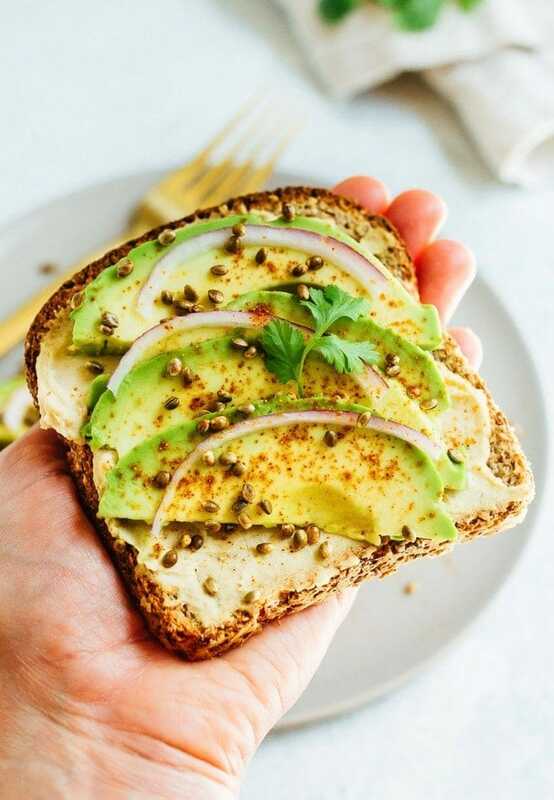 I’m hooked on the toasted hemp seeds because they have an awesome nutrition profile — one serving (about 3 Tablespoons) contains 8 grams of protein, 8 grams of omega 3&6 fatty acids and 9 grams of fiber! They’re the perfect thing to reach for when craving a crunchy, savory snack. I’ve been eating them by the handful, but they’re great as a topping for salad too. 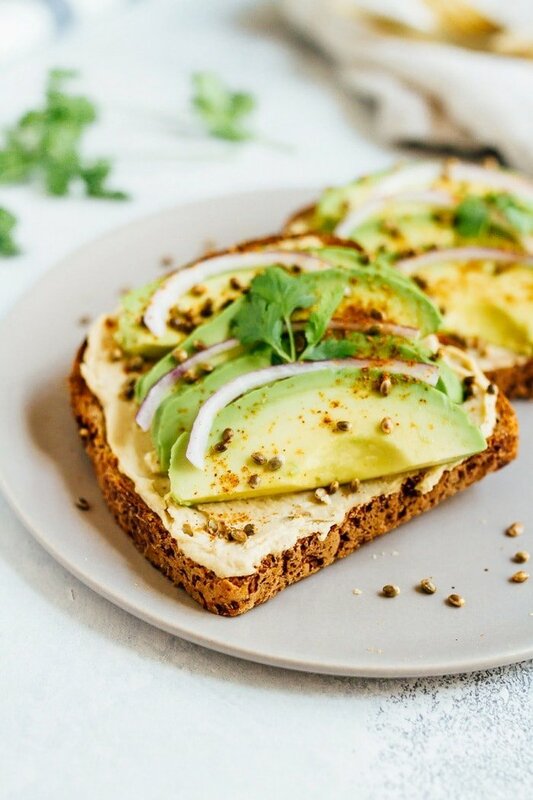 And they work like a charm for adding a nice crunch and a little bit of spice to this hummus avocado toast recipe. 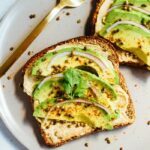 So whether you’re looking for a quick and easy breakfast idea or a delicious mid-day snack, this hummus avocado toast is a great solution. It’s super easy and comes together in less than 5 minutes. And it’s lovely for hot summer days where the last thing you want to do is turn on the stove. No cooking necessary! Grab 2 slices of toast. 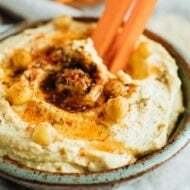 Spread 1 Tablespoon of hummus on each slice. 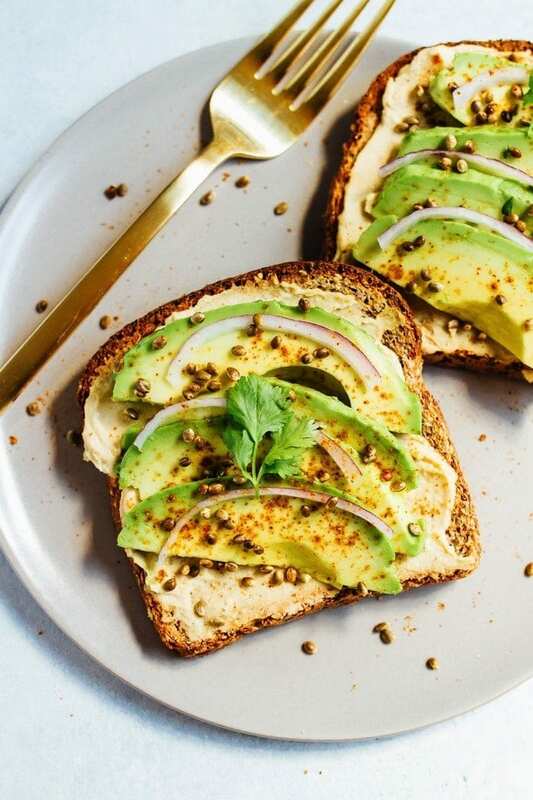 Top with sliced avocado, red onion and sprinkle 1 Tablespoon of toasted hemp seeds on each slice. Sprinkle on a little cayenne pepper (if using). Garnish with cilantro and enjoy! I haven’t tried it yet, but I bet this toast would be amazing with an egg on top! Want to try the toasted hemp seeds for yourself or make this recipe? Grab a bag from the Manitoba Harvest website. If you use the code EatingBirdFood you’ll get 15% off your full order. Now through July 31, 2017! This post is sponsored by Manitoba Harvest. As always, opinions are my own. Thank you for supporting the brands that make EBF possible. Hemp seeds are so new to me. This seems like an easy recipe to start introducing them! i know you gave the link to the hemp website, but can you find it in a store somewhere? I emailed my contact at Mantioba to ask about where the toasted hemp seeds are being sold currently. But yes, they are definitely offered on the website and you can use my coupon code for 15% off your full order now through the end of July! Just realized you also asked about what bread I like. Lately I’ve been eating Ezekiel bread (sprouted grain bread) or Barely Bread (gluten-free almond flour bread).